In stock -This product will ship today if ordered within the next 8 hours and 20 minutes. Clean skin is one of the best defences against ageing. 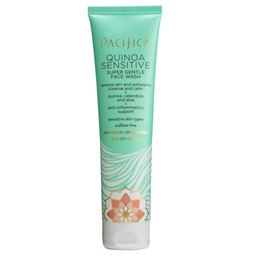 Gently bring your skin into balance with calming quinoa, calendula and aloe. Help support your skin`s natural oils. Remove makeup, pollution and the day`s toxins with gentle foaming for refreshed skin at any age. For sensitive & dry skin types. 100% vegan. Cruelty-free. Formulated without animal ingredients, petroleum, parabens and phthalates. Glycerin, Sodium Cocoyl Glutamate, Aloe Vera Barbadensis Leaf Juice, Helianthus Annuss (Sunflower) Seed Oil, Gluconolactone (Corn), Cetearyl Glucocide, Capric/ Caprylic / Triglycerides, Water, Glycerine, Caprylyl Glycol, Proanediol, Gylceryle Undercylenate, Sucrose State, Decyl Glucocide, Oryza Sativa (Rice) Extract, Glyceryl Caprylate, Bioflavanoids, Potassium Sorbate, Parfum (All Natural), Chenopodium Quinoa Seed Extract, Calendula Officinalis Flower Extract. Apply to damp face in upward circular motions Rinse thoroughly. Use morning and night. 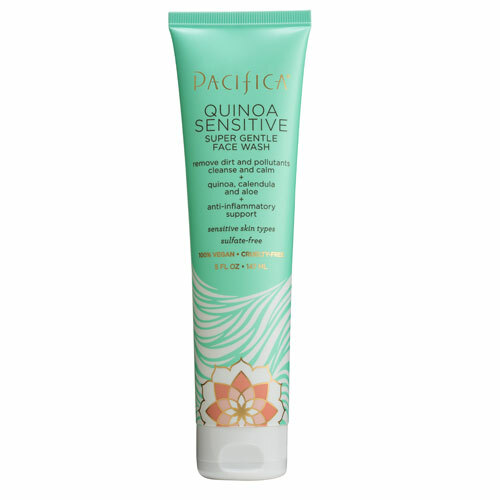 Below are reviews of Pacifica Quinoa Sensitive Super Gentle Face Wash -147ml by bodykind customers. If you have tried this product we'd love to hear what you think so please leave a review. Clean skin is one of the best defences against ageing. Gently bring your skin into balance with calming quinoa, calendula and aloe.